2017 Irrigated Corn Winner Don Stall (left) is pictured above with Clay Martz (right), Nutrien Ag Solutions Branch Manager. Don Stall is a sixth-generation farmer who runs an operation near Charlotte, Michigan. A Marine Corps veteran, Don returned to farming in 1986 after spending six years in the service. Today, he lives one mile from his family's original homestead, which was founded after his ancestors migrated from Ohio to Michigan in 1836. Since first entering the NCGA corn yield contest in 2004, Don has had some very impressive results. In addition to finishing in fourth place nationally several times, he has been the Michigan state winner eight times, including in the most recent competition. Last year was a first for Don, however, when he won first place nationally in the Irrigated Category. With a corn yield of nearly 407.22 bushels per acre, he nudged just past defending category champion Randy Dowdy (406.06 bushels per acre) in the 2017 competition. On the farm, Don uses a corn to beans to wheat rotation and minimum tillages practices, employing vertical tillage on corn to soybeans and a chisel plow in the fall so that corn can be planted the following spring. He describes his soil as heavy and "not very forgiving," with clay and sand loam types and a cation exchange capacity (CEC) ranging from 5-11 meq/100g. 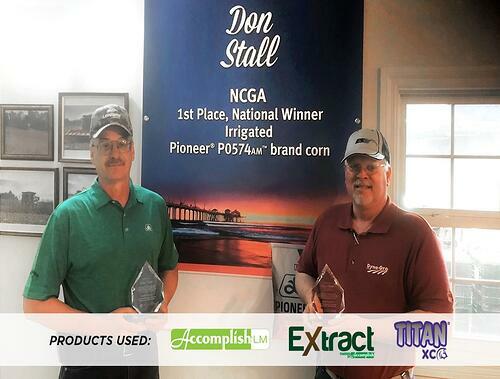 As part of his 2017 winning progam, Don used Accomplish LM, Extract PBA and Titan XC, relying especially on the Titan XC technology to release nutrients from his potassium and MESZ fertilizers. First introduced to Titan about nine years ago by Clay Martz of Nutrien Ag Solutions of Woodbury, Michigan, Don hoped that Titan would make nutrients in dry fertilizer available at a faster pace to plants—and it proved to do just that. “Now I automatically treat dry fertilizer with Titan XC so that nutrients are made available when plants need them,” says Don. The Stall farm, located near Charlotte, Michigan. Don applies his treated dry fertilizer using variable rate technology (VRT) and says that most of the farm receives 60-70 lbs of treated fertilizer per acre, although some spots receive up to 300 lbs/acre. However, that volume is declining due to increasing soil fertility. "Soil tests show that Don's soil nutrient levels have been maintained or even increased, with little or no increase in applied nutrients," notes Clay. "That's one of the things we have noticed since using biocatalyst products, which we implemented to improve nutrient availability from fertilizers, residue and the soil." In the past, Don applied Accomplish LM on crop residue in the fall to facilitate nutrient release. He now uses Extract PBA in the fall, which is the newer residue management product, and has moved his Accomplish LM application to the spring, where he applies it with starter in a 2x2 band. "Don’s achievements are from a total system program used for about nine years now," says Clay. "Everyone has the same opportunity and no two growers will follow the same program. Identifying when and how an application will work in your operation is key. Knowing your soils and reducing stress to the crop at all times are also critial." Clay also remarked that having even corn emergence was an important part of Don's success. "Even hours or a day will make a difference," states Clay. 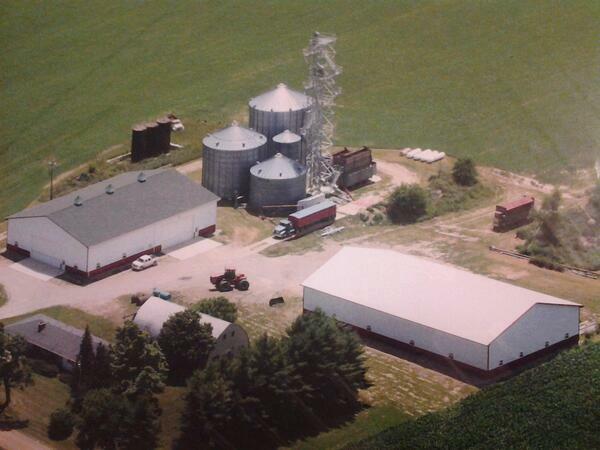 "Don’s harvested crop plants per acre consisted of 96.77 % of planted seeds. This alone was a substantial increase from 2016. What drove it? That's our secret!" 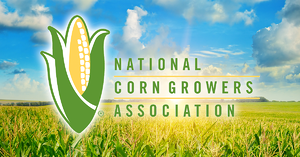 Don's goal for the 2018 NCGA corn yield contest is an ambitious 500 bushels per acre. "We have more ideas and concepts to put into action," says Clay. "The plan is set and under way now." To find out more about the other winners who used biocatalyst products, you can read our profile of Kevin and Shawn Kalb, who won two non-irrigated corn categories, or Jeannie and Wally Linneweber, who placed second in the AA non-irrigated corn category. You can also learn more about Accomplish LM, Extract PBA & Titan XC by accessing our Biocatalyst Technology booklet.